MYTH 2: Yesterday I went into a pizza restaurant to pick up an order that I had called in. I paid by using my Visa Check Card which, of course, is linked directly to my checking account. The young man behind the counter took my card, swiped it, then laid it on the counter as he waited for the approval, which is pretty standard procedure. While he waited, he picked up his cell phone and started dialing. I noticed the phone because it is the same model I have, but nothing seemed out of the ordinary. Then I heard a click that sounded like my phone sounds when I take a picture. He then gave me back my card but kept the phone in his hand as if he was still pressing buttons. Meanwhile, I’m thinking: I wonder what he is taking a picture of, oblivious to what was really going on. It then dawned on me: the only thing there was my credit card, so now I’m paying close attention to what he is doing.. He set his phone on the counter, leaving it open. About five seconds later, I heard the chime that tells you that the picture has been saved. Now I’m standing there struggling with the fact that this boy just took a picture of my credit card. Yes, he played it off well, because had we not had the same kind of phone, I probably would never have known what happened. Needless to say, I immediately canceled that card as I was walking out of the pizza parlor. All I am saying is, be aware of your surroundings at all times. INCOMPLETE ANSWER: Whenever you are using your credit card take caution and don’t be careless. Notice who is standing near you and what they are doing when you use your card. Be aware of phones, because many have a camera phone these days. TRUTH: The clerk should have handed the card back to the customer immediately after running the transaction. The fact that the pizza parlor employee laid the card on the counter was suspicious, as it should have been handed back to the customer immediately. 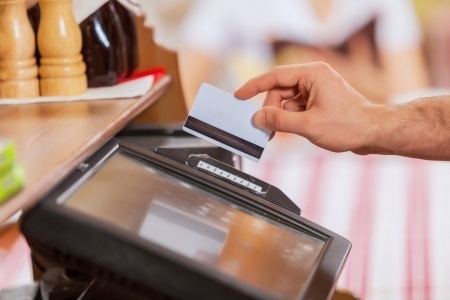 Once Chip & PIN cards are disbursed nationwide, and merchants begin widely accepting them in October of this year, the cardholder will retain possession of the card during the entire purchase. When that happens, consumers will insert the plastic into the payment terminal and leave it inside of the terminal, so the Chip can be read and the transaction approved. Upon the merchant receiving a transaction approval, the cardholder then removes their credit or debit card. The pizza parlor customer should have immediately alerted store management and called the police to file a report.